The anointing of the sick is administered to bring spiritual and even physical strength during an illness, especially near the time of death. It is most likely one of the last sacraments one will receive. 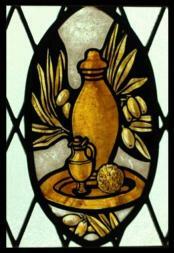 A sacrament is an outward sign established by Jesus Christ to confer inward grace. In more basic terms, it is a rite that is performed to convey God’s grace to the recipient, through the power of the Holy Spirit. Contact the parish office for more information. Like all the sacraments, holy anointing was instituted by Jesus Christ during his earthly ministry. The Catechism explains, “This sacred anointing of the sick was instituted by Christ our Lord as a true and proper sacrament of the New Testament. It is alluded to indeed by Mark, but is recommended to the faithful and promulgated by James the apostle and brother of the Lord” (CCC 1511; Mark 6:13; Jas. 5:14-15). The anointing of the sick conveys several graces and imparts gifts of strengthening in the Holy Spirit against anxiety, discouragement, and temptation, and conveys peace and fortitude (CCC 1520). These graces flow from the atoning death of Jesus Christ, for “this was to fulfill what was spoken by the prophet Isaiah, ‘He took our infirmities and bore our diseases’” (Matt. 8:17). Mark refers to the sacrament when he recounts how Jesus sent out the twelve disciples to preach, and “they cast out many demons, and anointed with oil many that were sick and healed them” (Mark 6:13). In his epistle, James says, “Is any among you sick? Let him call for the elders of the church, and let them pray over him, anointing him with oil in the name of the Lord; and the prayer of faith will save the sick man, and the Lord will raise him up; and if he has committed sins, he will be forgiven” (Jas. 5:14–15). The early Church Fathers recognized this sacrament’s role in the life of the Church. Around A.D. 250, Origen wrote that the penitent Christian “does not shrink from declaring his sin to a priest of the Lord and from seeking medicine . . . [of] which the apostle James says: ‘If then there is anyone sick, let him call the presbyters of the Church, and let them impose hands upon him, anointing him with oil in the name of the Lord; and the prayer of faith will save the sick man, and if he be in sins, they shall be forgiven him’” (Homilies on Leviticus 2:4). In the year 350, Bishop Serapion wrote, “We beseech you, Savior of all men, you that have all virtue and power, Father of our Lord and Savior Jesus Christ, and we pray that you send down from heaven the healing power of the only-begotten [Son] upon this oil, so that for those who are anointed . . . it may be effected for the casting out of every disease and every bodily infirmity . . . for good grace and remission of sins . . . ” (The Sacramentary of Serapion 29:1).